The past 4 Tuesdays have been pleasantly spent sewing with Natalie. The first Tuesday, I picked her and two of her sisters up and we went on a fun shopping trip to one of the only Walmarts in our area still selling cloth. The mission? 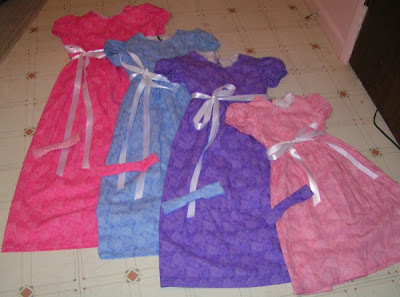 Find cloth, zippers, thread, and trim to make dresses for them and their little sister. We were delighted to find many different colors of one pattern of cloth, and they each picked out their favorite color. We found cute lace that matched them all, and decided on white ribbon for the sashes. Natalie is a 12-year-old girl that I've known for quite some time. This past year, she's asked me to teach her to sew many times, and this summer I decided to make it a priority. I arranged to pick her up from her morning swim practice each Tuesday and bring her with me to musical rehearsals in the evening, as she and her family were involved in them. Natalie has proved to be a wonderful student in sewing! She had learned some sewing previously with someone else, so she already knew the basics and how to use the machine. However, she needed some help figuring out patterns and how to do some of the more complex things. I would show her what to do, then as she worked, would have time to sew things I was working on. The first two weeks were spent finishing up projects she already had. 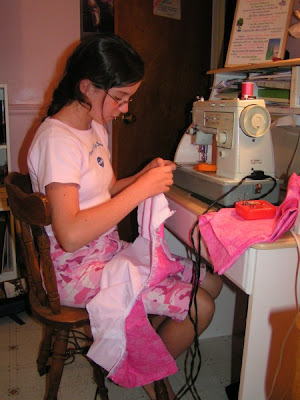 On those days, she finished two pairs of pajama tops and bottoms, and I sewed quite a few costumes for the musical (pictures from it to come tomorrow!). It was nice to have the time set aside to make those, while all the while teaching someone else to sew. It was very enjoyable to work with Natalie, and share funny stories and discuss different things as we sewed. Last Tuesday we began the dresses, cutting them out in the morning, and starting work on it. This was the first dress Natalie had made, but she did very well on each new step. She worked on her dress, and I sewed her sisters' dresses, finishing one last Tuesday, one yesterday, and one today! Aren't they lovely? All the pretty colors go so well together! Since we had so many fabric scraps, and I had a little extra time while Natalie finished up her dress, I quickly made up bows for each girl to wear in their hair. 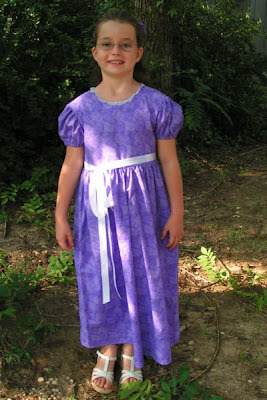 The pattern was Simplicity pattern #9497 - a great and versatile pattern for any girl's dress! 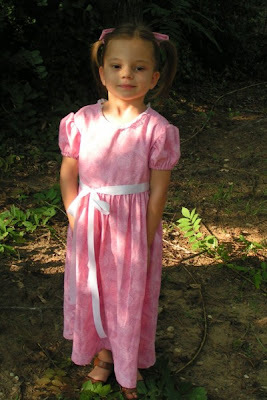 The above picture is of a dress I made for my niece Danielle for her birthday in May, using the same pattern. 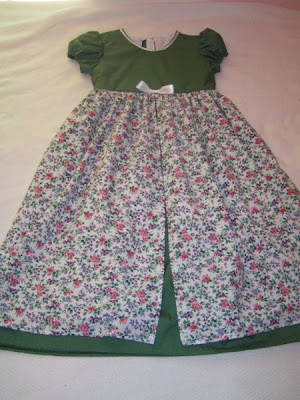 The pattern is also the one I used for the flower girl dresses I made. It's fun to find all the pretty ways to use it! 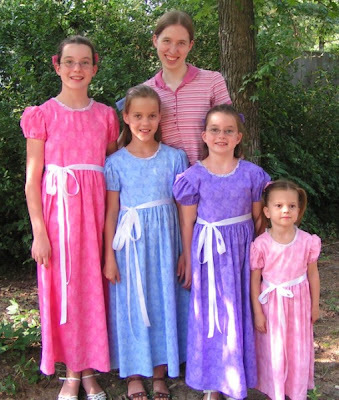 The 4 sisters looked so sweet in their matching dresses! I like how they match, but they're not identical, for each girl has her own special color. It was fun to see how the same lace was brought out in different ways by each color. Natalie, who is 12, chose the fun, bright pink fabric! She did a good job on her first dress! Katherine, who is almost 10, chose the lovely and cool light blue. Abigail, who is almost 9, chose the fun and vibrant purple! Since Gabriella, age 3, wasn't with us when we went shopping, her sisters chose the light pink for her. She really liked it, and it looks so cute on her! Sewing these dresses has been a lot of fun! I got the idea while in church one day, looking down from the balcony to see these girls standing with their parents and two brothers all in a row as we sang. 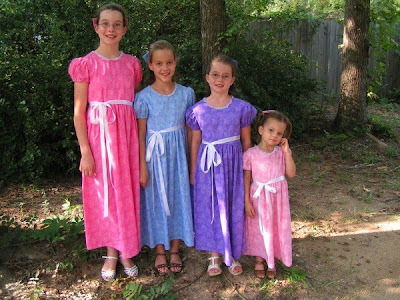 As I saw them all together, I wondered to myself whether or not they'd ever had matching dresses made for them, and thought how much fun it would be to do it. Since Natalie already wanted to learn to sew better, I arranged to make the dresses and teach her at the same time. These girls have been such a joy in my life, and I feel blessed to count them as my friends, though they are younger then I. We've been in churches together, camped together, and played games together. I've babysat them, taught them ballet, and directed 4 musicals involving them. I'm glad I had the opportunity to sew for them before I leave! Absolutely adorable! You are a good teacher, Anna. I've got to see if I have that pattern and if I don't I've got to go get it to make some dresses for Ruth Marie (my niece). Natalie and her sisters look very sweet. You are a good example of learning how to dress and act sweetly! Good job. Natalie is a very lucky girl to have you to teach her! I would love to be able to have one-on-one teaching with a gentle, loving friend like you. The dresses truly are gorgeous! The colors are wonderful for summer and the matching bows are perfect. I agree with Jody - you are a good example of how to dress, act and learn homemaking skills. Jody: I was happy when I found the pattern! Hobby Lobby was having a sale on Simplicity patterns ($1 each!) so I was looking through the book and just knew I had to get such a nice pattern for a girl's dress! Between Hobby Lobby and Hancock's, one or the other of them often has patterns on sale for $1. Becky: Wish I had time to teach everyone to sew, but it does take a while! =) I was happy to have the opportunity to teach Natalie. What wonderfully adorable girls. They all look so sweet and pure in their matching dresses. Natalie did a very good job for her firts dress. What a wonderful example to her of what a loving older sister should be like. The girls look absolutely beautiful in their dresses. 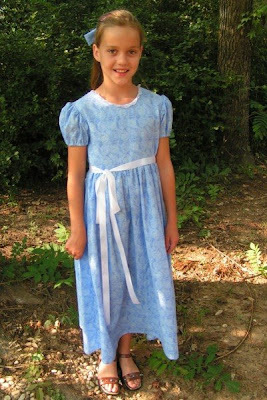 I've considered sewing myself a modest cute dress but I have never sewed before in my life but I think it would be fun to learn so that by the time I have children of my own I would be able to sew for my own daughters. They are absolutely lovely! I can't wait for my daughter and I to learn to sew! Maybe we can make her and her sister some matching dresses too! The girls are pretty in their dresses! The dresses are pretty too! That was nice of you to teach her to sew, and to sew dresses for her sisters. 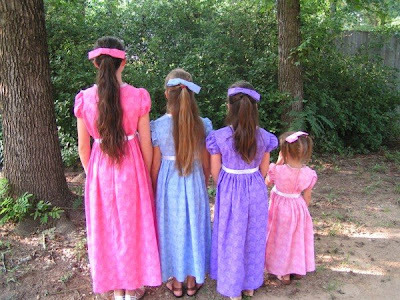 I haven't sewn a dress, but for months I've thought about sewing a couples dresses for two little girls at Church, children's clothes are so cute! Seeing these pictures, I think I might just do it! What sweet girls in sweet dresses!! I like the fact that the all had the same style and pattern, but different colors! Could you teach me some tips, please?! =) I would appreciate having someone there to help decipher patterns....especially when they seem to leave steps out! The dresses are precious! Could you recommend any pattern numbers for young ladies aged 13-15? Also, I want to try your malt-o-meal muffins. I nave seen a variety of malt-o-meal cereals in the grocery. Which one should I use? I hope all your girls' sewing goes well! 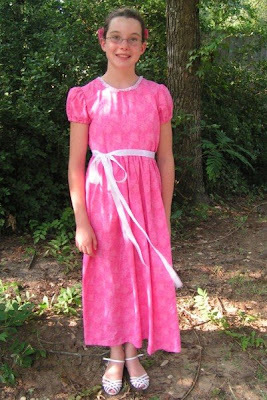 Beth: Most of the dress patterns I've recently used are out of print, though I've made a lot using Simplicity Costume Pattern #5041. Common Sense Patterns (http://www.commonsensepatterns.com/csp_main.htm) has some good patterns though. The kind of Malt-o-meal is just the original kind. I don't know if I seen many different brands - any kind should do! Is the malt-o-meal you use in the cereal section of the grocery? I'm not sure which is the original. Is what you use a cereal in a bag? Beth: I think it's in the cereal section. Mom hasn't always been able to find it in stores, so we buy a lot when we can. The stuff we buy is in a yellow box that says "Malt-o-meal" in big letters and "original" further down. I don't know if they have ones in a bag, but they may. If it says Malt-o-meal, it's probably okay to use! Maria Pauline: It's great that you taught a friend to sew! I'm sure she'll enjoy using her new skills.